Every day many dog breeders do harm to their pets, without having the slightest idea about it. The reason is a usual piece of dog equipment namely the dog collar. 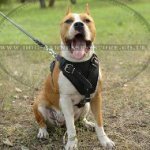 Everybody can remember how a temperamental or just an ill-mannered dog behaves during a walk: it is pulling on the leash all the time, you can hardly control it, its breath gets heavy and whistling, in extreme case the dog chokes, it sometimes even feels sick. The dog breeder is nervous, it's unhealthy for the dog, instead of mutual joy, the walk turns into a tag-of-war. Famous Swedish zoo-psychologist, after examining several hundred dogs from different Swedish canine clubs, came to a conclusion that most of them (more than 90%) had injuries of the neck and the spinal cord, causing pain syndrome. 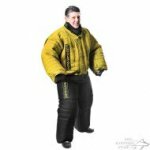 Again, as a reaction on pain, there appeared such behavioral disorders as fear susceptibility, aggressiveness, unpredictability of the dog. 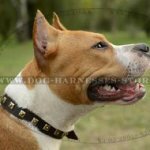 Injuries of the neck, back, throat and thyroid gland soft and cartilaginous tissue are mostly caused by jerks of the dog leash, especially when you use pitch collars and heavy chain leashes. 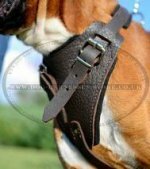 As an alternative to any kind of dog collar any - even a soft, wide and less traumatic one - many European trainers recommend dog harnesses as a less abusive and safer accessory for walks and control of the dog. Harness originally appeared as a part of dog sled, to use the dog as a draft animal. Obviously the harness must be functional, comfortable and safe, otherwise the dog just refuses to pull the weight. 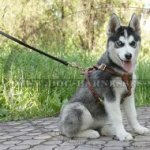 The application area of dog harnesses is much wider today: beside the dog-sled harnesses there is everyday harness, sport harness, tracking harness and harness for dog power training etc. 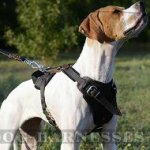 Classic dog harness consists of two main belts, banding the animal along the chest and along its body and connected in four points: between the forelegs and along the spine line. The leash is fastened to a point on the top of the shoulder. 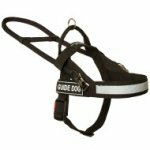 In distinction from the collar the harness allows to proportion the burden on the chest and the locomotorium, without pressing the neck, so the dog feels more comfortable and the dog breeder can control its behavior easier. 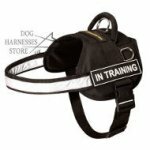 Certainly you should not idealize the harness, it also has disadvantages, e.g., put on an ill-mannered dog, it displays all failures of training. 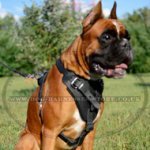 Though if you cannot do without jerks, the right choice and usage of the harness can let you avoid neck and throat injuries of your dog. 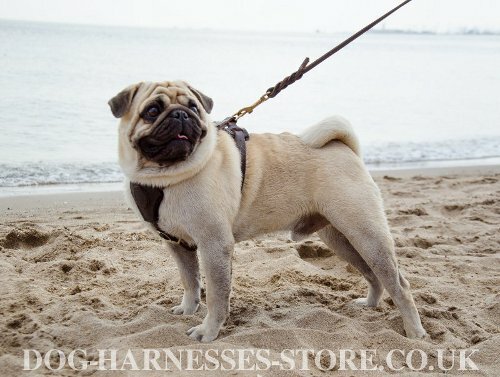 Learn also about how to choose dog harness. 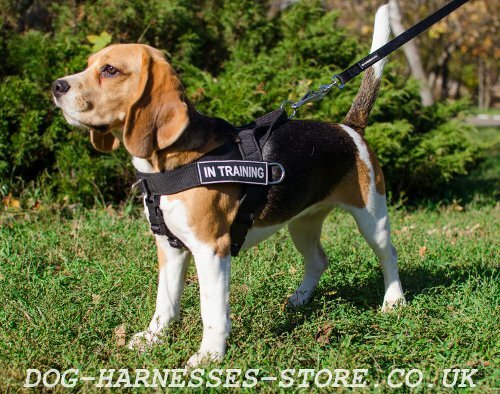 Choose the best harnesses for large, medium and small breeds in our online dog store!